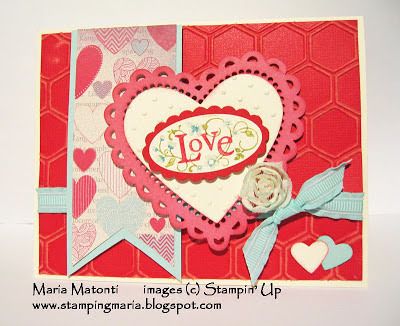 Maria's Stamping Station: Stampin' Up Valentine's Day projects using More Amore DSP and more! Stampin' Up Valentine's Day projects using More Amore DSP and more! Colors on the card are Primrose Petals, Real Red, Pool Party, and Very Vanilla. 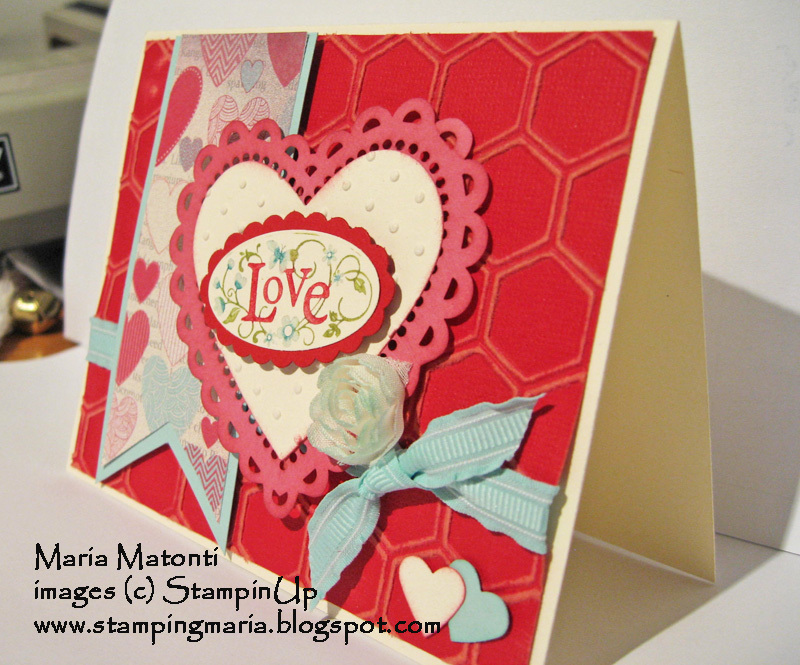 I used More Amore DSP, Real Red Core'dinations cardstock, and Pool Party and Very Vanilla cardstock. You can't see it well, but I ran the Red Core'dinations paper through the Honeycomb embossing folder then sanded it. The "Love" came from the You Are Loved stamp set; I colored it with Real Red, Lucky Limeade, Pool Party, and Island Indigo markers. Finally, I added some Pool Party ruffled ribbon and a great flower from the Flower Trim ribbon in the current Spring Mini Catalog. I dyed it with a sponge and Pool Party classic ink. 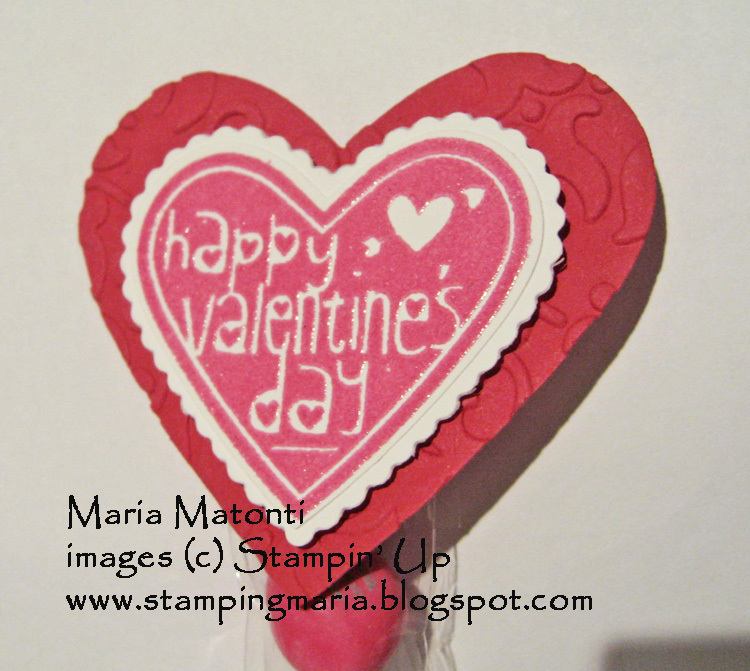 This Valentine treat was made with the Valentine bundle Stampin' Up offered last month. I put peanut M&M's in the 1x8 cello bag then topped it some hearts. I stamped the "happy valentine's day" in VersaMark then used Melon Mambo embossing powder on it and cut it out using the Full Heart Punch. Then I layered that onto a heart I cut out using the Scalloped Heart Embosslit and finally I layered that onto a heart that I die cut using a Heart Framelit. I ran the biggest heart through the Vintage Wallpaper Embossing folder. PS: Thanks Kadie for the photo upload help; it seems to be working for now - why does Blogger change things, and not for the better! Maria: Did you upgrade to Windows 5? That's when I started having all my problems. This new way of doing it gets the job done....but seems to take so much longer to do. Don't forget you can upload pics onto blogger and then do Ctrl C (copy) and Ctrl V (paste) to move and arrange your pictures around your blogger post. I think it's all good.....Nice projects!